Elmira Stove Works Blog – Page 11 – ANTIQUE & VINTAGE APPLIANCES SINCE 1975. ANTIQUE & VINTAGE APPLIANCES SINCE 1975. Accentuating their retro appeal, Steam Whistle Brewing recently selected an Elmira Northstar fridge to feature in the popular Toronto, Canada brewery. With a name inspired by an icon of the 1950s working class, Steam Whistle has an affinity for retro style, from their brewery location to their delivery trucks. Elmira Stove Works has been manufacturing vintage-styled appliances in Canada since 1975 and the Elmira Northstar refrigerator was a fitting choice to store Steam Whistle Brewing’s pilsner. Steam Whistle has always used antique fridges in its brewery, hoping to complete their retro brewery with a vintage refrigerator. However, the compressor systems in antique fridges were not up to date and the fridges were using far too much energy for eco-minded Steam Whistle Brewing. For this reason, Steam Whistle chose the Elmira Northstar. Elmira’s Northstar appliance line offers 1950s inspired appliances, including ranges, microwaves and refrigerators. Available in nine colors as well as a custom color option, the Elmira Northstar refrigerator has been acclaimed by many prominent kitchen designers and cooks as the ultimate in retro kitchen style. With chrome trim, bright colors and smooth lines, the Northstar line instantly creates a retro transformation, offering a quick and easy remodeling option. Steam Whistle Brewing also chose to custom color match the Elmira Northstar with the celebrated Steam Whistle green. 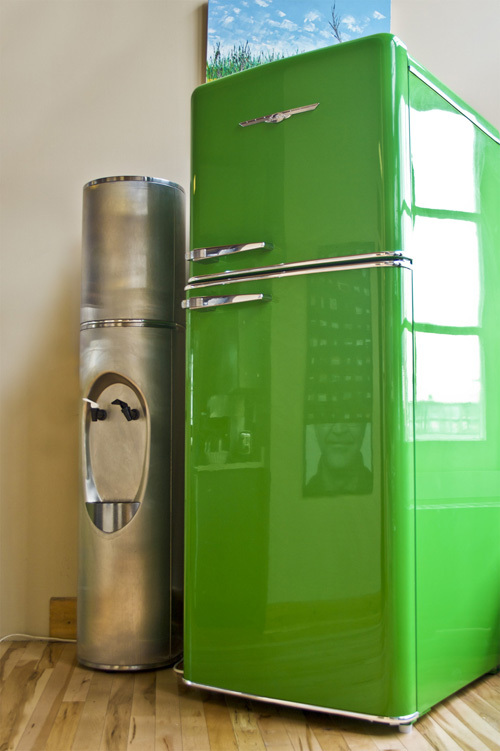 Elmira Stove Works’ custom coloring process produced a “perfect” fridge, with the retro design, modern technology and the exact green hue. For more information on Elmira’s Northstar refrigerators, visit www.elmirastoveworks.com. Steam Whistle, an independent brewery housed in Toronto’s historic John St. Roundhouse, has a singular focus of making just one beer of exceptional quality that Canadians can be proud of. They brew their refreshing Pilsner with traditional brewing methods and only four, natural ingredients. Steam Whistle Pilsner is packaged in signature green glass bottles, cans and draught, and is shipped fresh across Ontario, Alberta and more recently BC to Beer and Liquor Stores as well as licensed bars and restaurants. Steam Whistle welcomes more than 95,000 visitors to the brewery each year to the on-site retail store, for a tour, or to attend one of the many on-site events and art shows. Highly awarded for its premium beer, its business success, community support and environmental practices, Steam Whistle Pilsner is now one of the top selling premium beer brands in Ontario.